Eltronicschool. - This is one project for you who want to measure the voltage from 0 until 25V using voltage sensor module and Arduino microcontroller in this time. Using this project you will get many information to make sketch, schematic, voltage sensor module and other. Accordingly Henrysbench blog that also published this project describe that the Arduino analog input is limited to a 5 VDC input. If you wish to measure higher voltages, you will need to resort to another means. One way is to use a voltage divider. 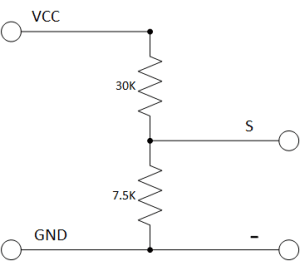 It is fundamentally a 5:1 voltage divider using a 30K and a 7.5K Ohm resistor. To get the program to measure the voltage sensor and arduino module, you can use the sketch with visit here.